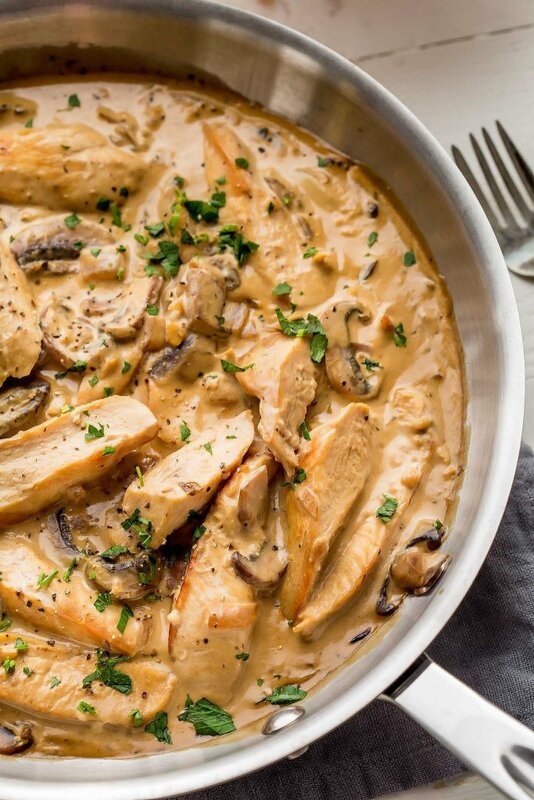 This chicken marsala recipe adds in dijon mustard & creamy mascarpone cheese. It’s a rich dish that’s easy to prepare but totally impressive. Being that the name of this blog is “Platings & Pairings” you can probably guess that I’m a big fan of wine. My boyfriend and I go wine tasting quite often, and one of our favorite places to visit is Walla Walla, Washington. It’s about a 4-hour drive from Portland and the wine country there is so different than here in Oregon. While Oregon is known for its Pinot Noir and Pinot Gris, Washington offers bigger, bolder red wines like Cabernet, Merlot and Syrah, so it’s a nice change of pace. Another difference is that most Walla Walla tasting rooms are not actually located in the vineyards themselves, instead, it’s more of an urban experience which is great because you can walk from tasting room to tasting room and discover your favorites. One of our favorite tasting rooms in downtown Walla Walla both for their wines and the ambiance is Charles Smith Wines. The space is wide and open with a minimalist décor and large garage door style windows that open up to the sidewalk patio when it’s nice outside. Charles Smith debuted his first wine in 2001. A former rock band manager, his style comes out in the labels found on his wines. Black and white in color with bold illustrations, each label is unique and reflects the name of the wine. Two of my particular favorites are the Eve Chardonnay and The Velvet Devil Merlot. The Eve Chardonnay label prominently shows an apple and hints at the crisp, freshness of this particular Chardonnay. It’s a medium-bodied, juicy, dry white wine with flavors of ripe pear, tangerine and guava, and a nice minerality on the finish. The Velvet Devil Merlot takes things in a different direction. Inspired by Charles’ desire to bring back Merlot after the movie “Sideways” gave it a bad name, he made this wine full-bodied, juicy and silky, with dark berry aromas and notes of cedar, tobacco and earth. This wine was been named by Wine Enthusiast as a Best Buy 3 years in a row. As much as I love drinking wine, I love cooking with it too. Wine can impart such a great flavor to dishes. It’s amazing how just a splash can transform a dish. Marsala, the wine used in this dish, is not one that I typically drink on its own. I keep a bottle of it next to the dry Vermouth which I also always have on hand to flavor dishes like Chicken Piccata or Risotto. These bottles keep indefinitely and are ready to throw into recipes at your heart’s desire. This chicken marsala recipe also adds in some tangy dijon mustard, creamy mascarpone cheese and earthy mushrooms. I love to serve it up over some fettuccini so that I can soak up every last bit of that yummy sauce. Pairing this dish with the Eve Chardonnay was a winner! 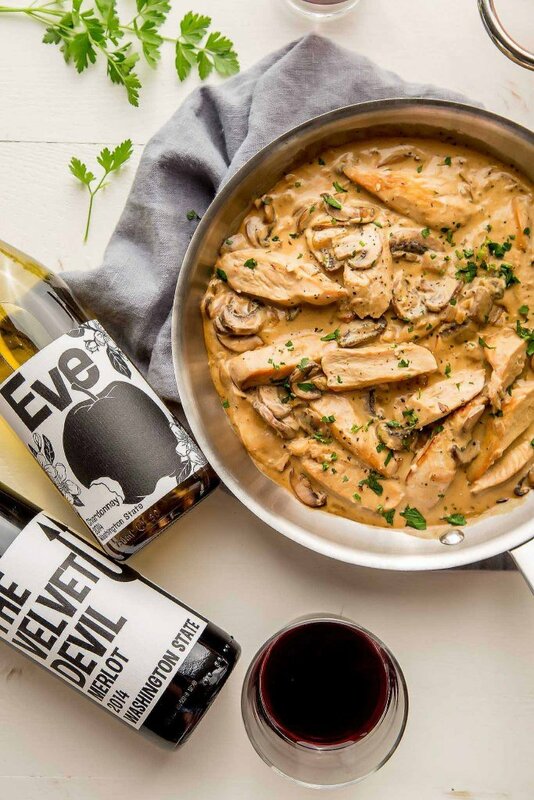 The creamy sauce played nicely with the fresh, crisp flavors of the chardonnay and the wine had just enough body to stand up to the rich chicken marsala. However, it’s a toss up as to whether I favored the pairing of the Eve Chardonnay or The Velvet Devil Merlot. The merlot had an earthiness to it that went really well with the mushrooms and its silkiness was echoed by the chicken marsala sauce. 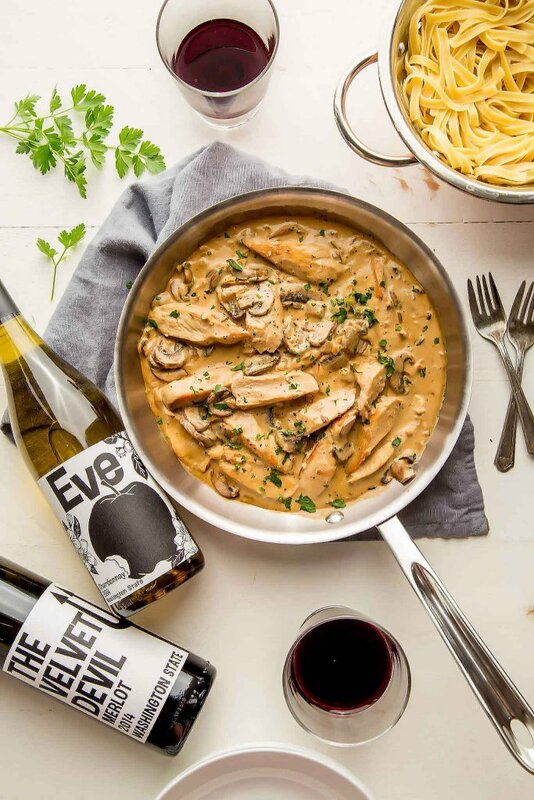 Which wine pairing would you lean more towards for this chicken marsala? The merlot or the chardonnay? I’d love to hear in the comments below. 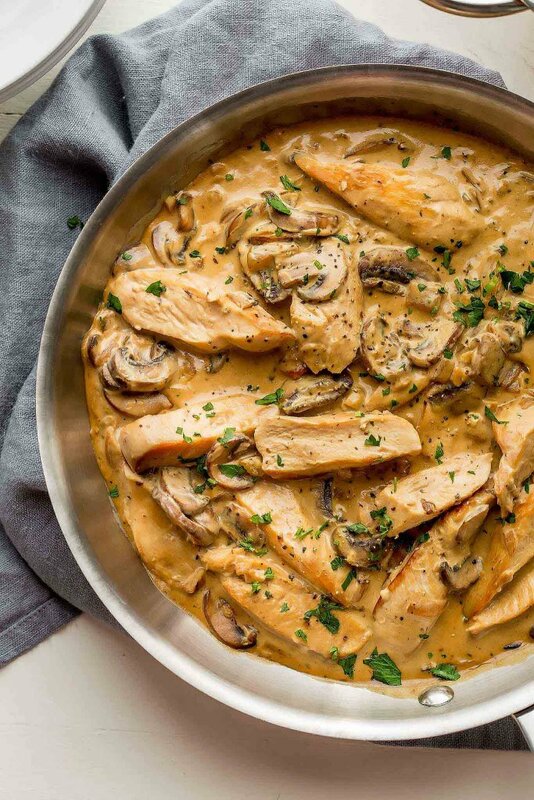 This chicken marsala recipe adds in dijon mustard & creamy mascarpone cheese. It’s a rich dish that's easy to prepare but totally impressive. Season the chicken with salt and pepper. Heat the oil in a large skillet over high heat. Add the chicken and cook until browned, about 4 minutes. Transfer the chicken to a plate and tent with foil. To the same skillet, add 2 tablespoons butter and reduce the heat to medium-high. Add onion and cook until translucent, about 3 minutes. Add the mushrooms and garlic and saute until the mushrooms become tender and their juices evaporate, about 12 minutes. Add the marsala and simmer until reduced by half, about 4 minutes. Stir in the mascarpone and mustard. Return the chicken and any accumulated juices to the skillet. Simmer, uncovered, over medium-low heat until the chicken is just cooked through and the sauce thickens slightly, about 2 minutes. Season the sauce, to taste, with salt and pepper and stir in the parsley. Meanwhile, bring a large pot of salted water to a boil. Add the fettuccine and cook until al dente, stirring occasionally, about 8 minutes. Drain. Serve the chicken and sauce over the prepared fettuccine and enjoy. Washington Wine Month: Welcome to Washington: Home of the Charles Smith Wine collection. Washington state has more than 900 wineries and 350 vineyards. #WAWineMonth calls on you to explore and support local award-winning brands that put Washington winemaking on the map. To learn more, visit www.WaWineMonth.com. Love how creamy this sauce looks! I will have to give this a try. 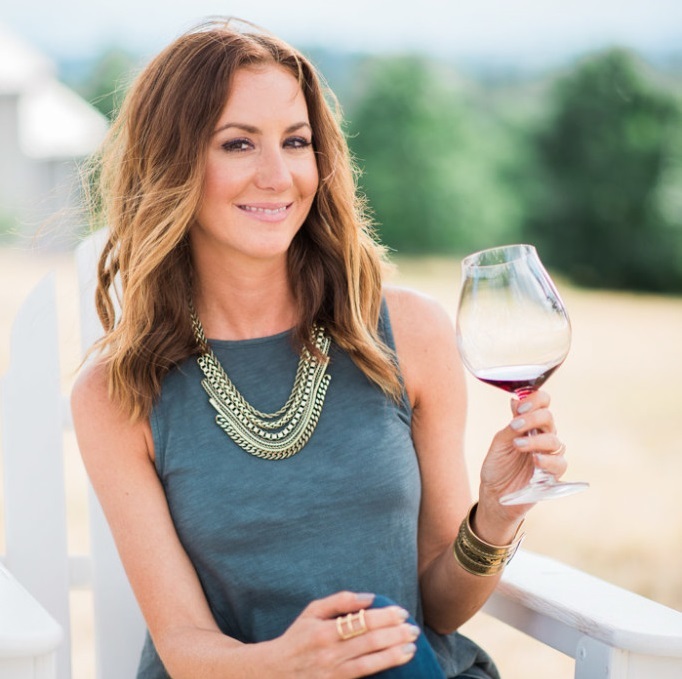 Thanks for highlighting eastern WA wines, too! Thanks Meg! I’m a huge fan of the Walla Walla wine country for sure! This dish sounds and looks so delicious! I’m making this dish this week. Erin, this looks so delicious! I always save a teeny tiny bit of wine to use for cooking because it’s such a great added ingredient. Dijon Mustard is one of my favorite ingredients to add to a dish, definitely want to try to make this recipe at home. Thank you so much for sharing! I hope you enjoy it Billy! Cheers!! Chef Giada DeLaurentiis is in our company cafeteria today making this dish along with a couple of great sounding sides. And I have a physical this afternoon and can’t eat until after the physical. So, I’ll try the recipe this weekend.